As my friendly farmer neighbor has corn planted in the field I use to access the beaver pond I have not been able to go back there for about two months now. Lacking the ability to go there, I set out today to see what else I could see. First I spotted these mushrooms. 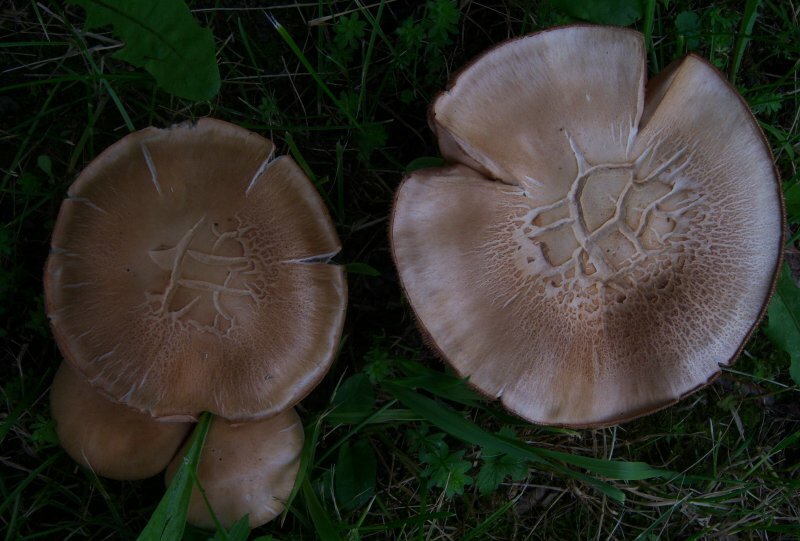 I have no idea what kind they are, but I thought they had interesting patterns on their surfaces. There were about twenty of them there, but I won't bore you to death with photos of all of them, but thought you might enjoy just one. 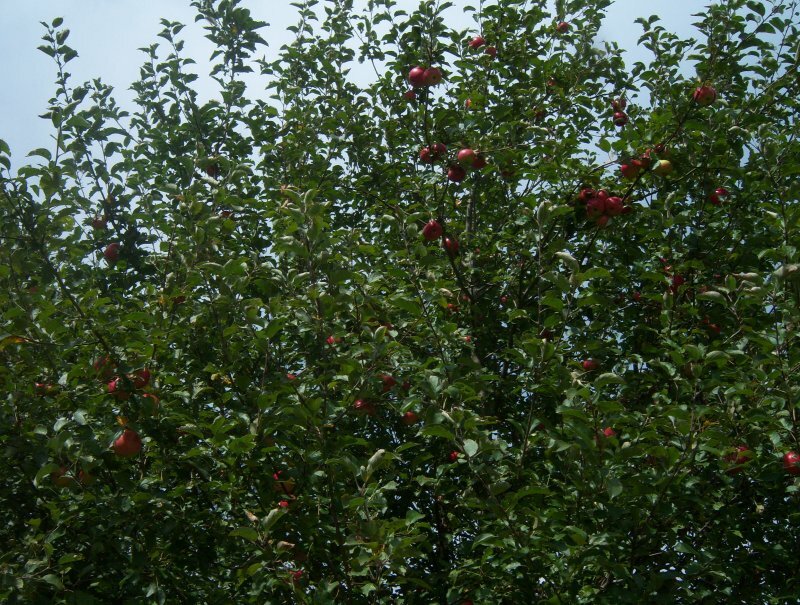 Next I drove under an apple tree that has grown wild on my property. Aren't those beautiful juicy looking specimens high in the tree. I need to take a ladder back there and pick at least one to determine what it tastes like. 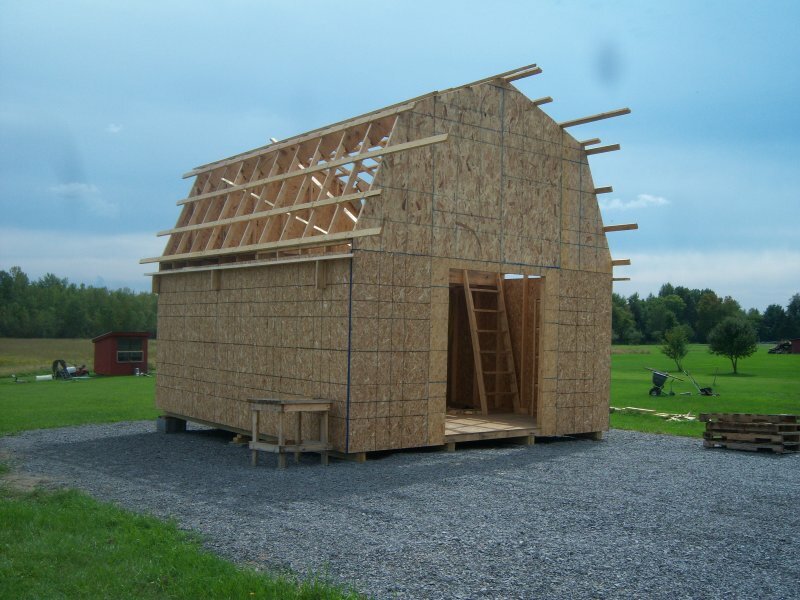 When I returned to my home I continued across the road to my nephew's place and snapped a shot of their storage building they are in the process of building. 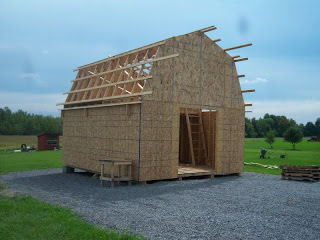 Each day they work a little more on it, and it is beginning to look like a real building now. 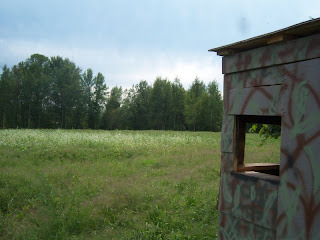 I continued on past the storage shed and took a tour of part of my nephew Bernard's property. Over on the back corner of it his nephew Brian has planted some soy beans and turnips in small plots. I've never asked the question, but I wonder if it has something to do with that deer hunting shack in the foreground? All in all it was a nice half hour spent on the ATV. Stephen Grover Cleveland was born March 18, 1837, thus was a 47-year-old bachelor when he entered the White House as the American President in 1885. The following June 2 he married the 21-year-old Frances Folsom in the Blue Room of the White House, the only President ever to have wed there. Grover Cleveland was the only President ever to have two non-consecutive terms in office. His first was from 1885 – 1889, while the second was from 1893 – 1897. The Cleveland’s first daughter, Ruth was born in 1891 in between Grover’s two terms. One hundred eighteen years ago today, August 30, 1893 their second daughter, Esther, was born as the first and only Presidential child to ever be born in the White House. 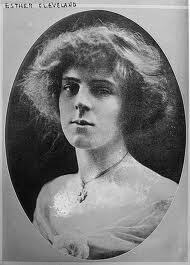 The President’s daughter in 1918 married Captain William Sidney Bence Bosanquet of the British Cold Stream Gaurds. Her husband died in 1966, while the beautiful daughter of a President, born in the White House, lived on until she died in New Hamshire June 25, 1980. I was 6 or 7 years old, and my sister Mary was maybe 13 or 14 at the time. We were sitting side by side at our parents kitchen table doing school homework. Suddenly Mary said, "I can bring a dead fly back to life." Living on a dairy farm during the 1950s I had seem about a zillion dead flies in my short lifetime, but I never saw any of them return to life so I laughed at that idea. Mary picked up a drinking glass about half full of water that had a drowned fly in it. She asked me, "Is that fly dead?" It certainly looked like it to me so I agreed it sure seemed dead. Mary poured a little salt on the table from the shaker sitting there. She placed the 'dead' fly in the salt and began to gently stir it around with a toothpick. After a minute or so the fly flew away. I was astounded. I don't know now what the trick was, but I suspect she had seen the fly enter the glass and knew it was not dead, but merely in a state of distress. Maybe she did know how to return a dead fly to life again. 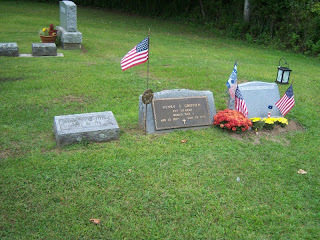 As people who dabble in genealogy oft do I was wandering through the Flackville Cemetery yesterday. What should I spot, but the following stone. It appears to be fairly recently installed, with flowers freshly planted, and cared for. However it did not appear to be a particularly recent burial. It is possible there is no one even there at this time. Obviously what drew my attention was the inscription. 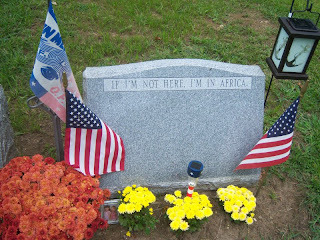 Why would a tombstone say what this one does? It has a solar powered light in front. The flags may denote that the person buried, or who will be buried, there is, or was, military. The light to the right with the anchors, may denote a Navy career. The flag at the left rear denotes a member of the International Order of the Odd Fellows, whatever it is that they do. The second photo shows that the stone is apparently a part of the Griffith family, in some manner. Benjamin Griffith was a local farmer that I was acquainted with in my younger days. I don't know what the relationship may have been. 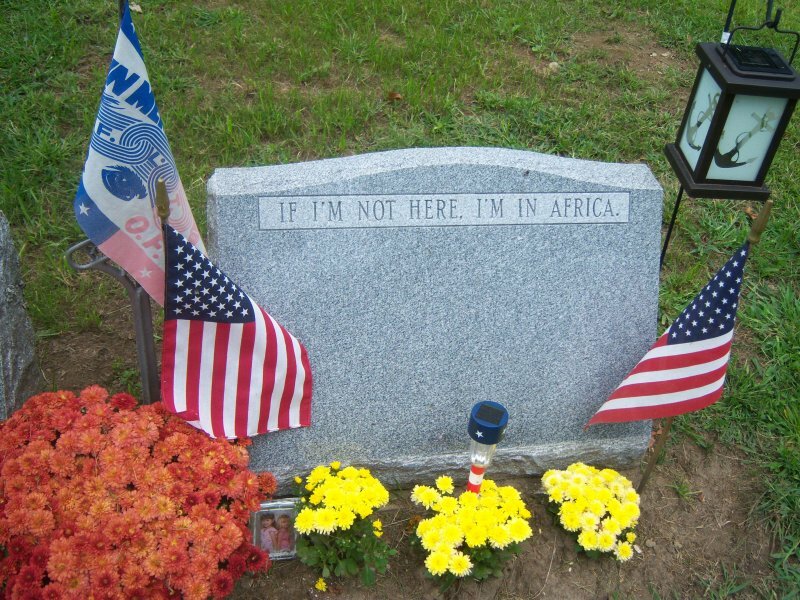 It just seemed odd to me, to have it on a tombstone, "If I'm Not Here I'm In Africa." I wrote this as a short short story while in a creative writing class in college a dozen years or so ago. We was brung up on a farm. Before we was very old we knew all about life, how it came to be, and how short it could become. Our farm was a dairy and we knew all about calves being borned, and how before they was a day or two old they went off to the veal market. Short and sweet, life was quick. What difference did it make? Animals was dumb anyway. There wasn’t any of ‘em had a lick of sense. When we was filling the silo with corn, and all the juice was squashing out, our chickens would happen along and gulp it. Now if you think animals ain’t dumb, then you just ain’t never seen a drunk chicken. I was ten when we got Stupid. No, we didn’t get stupid. He was a puppy that showed up and adopted us. He was just one of them strays of life that happen, I think. Stupid would chase his tail ‘til he’d get dizzy and fall down. Then he’d chase my rabbit, ‘til Bugs would get sick of it and stop. Stupid didn’t know what to do about that. One day Stupid got too close, latched onto poor Bugs, and broke his neck. Stupid just sat there with his head cocked sorta cornerways and stared. His friend wouldn’t run any more. As I watched a tear coursed down my cheek. From the wind, I think. Animals is all dumb anyway. Thomas Wolfe wrote a book, published posthumously in 1940, titled “You Can’t Go Home Again.” It dealt with a character that had written a book about his home town. In this fictional book within a book, the writer told tales about home town characters that were not necessarily flattering. The home town characters took umbrage with what had been said within this inner book. In one sense the author could not go back home again due to his writing, but there were also deeper meanings dealing with no one can ever go back to where they once were. You can never return to your youth in Anywheresville; the fountain of youth is yet to be discovered. While contemplating this state of affairs I began to wonder about where is home? Is it possible that you can’t go home because you don’t know where home is? I once read that you are lost when you don’t know how to get to your home. Does that also have a deeper meaning? Are you lost along the highway of life when you no longer know where home is, or ever was? Where or what is home? Is it where you’re presently living, or is it where your parents lived? Are you home now, or were you home when you were living within the safety of your parents abode? Or does it have nothing to do with a living space? Is home a larger sense such as an entire village? I lived in my parents’ farm home for fourteen years. I have lived where I presently reside for over thirty-five years, yet I think of home as where I was raised. It is where I spent my formative years and thus is home. My brother Lawrence and his wife Patricia had two sons (and three daughters), one named Tim. Tim and his wife Marion have three sons named Brian, Pat, and Benny. Tim lives a couple of places down the road from me. About a year ago Brian and Pat moved a mobilehome across the road from me. Now the boys are building a storage shed which I’m reasonably sure will be used also as a workshop for those mechanical malfunctions that happen to things like Snowmobiles, ATVs, lawn mowers, etc. Pat, especially, is very good with woodworking also, so I expect to see some of that going on. 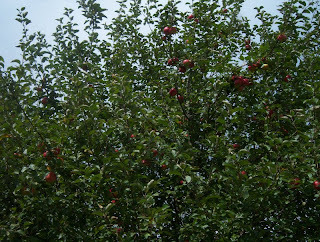 I snapped this photo yesterday afternoon, Sunday, August 14, 2011. It is a work in progress as is readily notable. The boys are laying out the rafters using the upper floor surface as a work area. With no shirt on is Benny, kneeling and nailing is Brian, while the third fellow is a friend of theirs. Pat was on the ground at that moment. 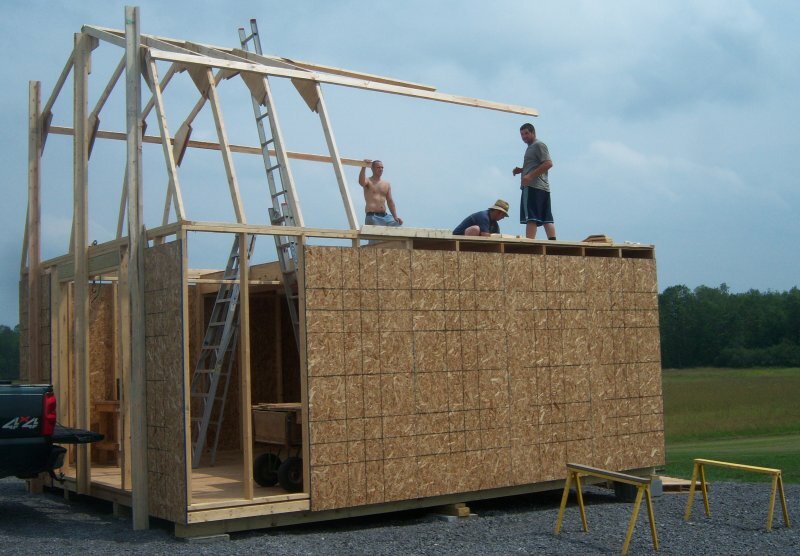 By evening, when a rainstorm stopped them, all rafters were built and in place. That quote seems to fit Chester exactly. Who is Chester? 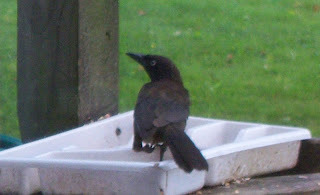 Why that is a young grackle that lives around my home. He first appeared about a month ago as part of a duo, with little doubt a sibling being the other half. I noted him feeding with other birds from a bit of seeds left on the ground on our lawn. Soon the sibling left, but Chester yet comes several times a day to partake of whatever he can find in and around the bird feeding stations. For the most part, if you’ve seen one grackle you’ve pretty much seen them all, but Chester stood out in the crowd because he hopped instead of walking like all the rest. Soon I noted that his left leg was crippled and did not function in the same manner as his right one did. Often he carried his tail to one side to offset his balance from the bad leg, but he thrived, handicap or not. He became Chester named after Chester Goode, the deputy for Matt Dillon. While reading some information on grackles one day I found that due to his rather mousy brown coloration Chester is way more likely to be a female than a male, but it is too late now as to call her Chester seems to be ingrained in me now. She seems to be able to fly normally so with some luck the tough little lady will hopefully live a long and fruitful life. My parents owned and operated a dairy farm between Ogdensburg and Canton from 1941 until they reached a retirement age. At that time my brother Fred bought the home place and operated it until his death a few years ago. Now his son Leslie is the operator so it remains in the family 70 years later. For many of those years the farm’s product went to “the milk factory” which officially was the Ogdensburg Creameries of Ogdensburg, New York. Every morning, seven days a week, a stake rack truck drove into the yard, several 100 pound “station cans” filled with raw milk were loaded by the driver, and then he drove away to the next stop on the route to repeat the process. Who was that young man that stopped faithfully every day? Of course, it was none other than a neighbor, a friend, and a hard worker named Mortian “Mort” Backus in his early twenties at the time. About 1954 my brother Bert bought the truck and route from Mort and continued its operation for a few years. While Mort was running the milk route, he was simultaneously buying older cars, repairing them, and reselling them from time to time. When he sold the milk route this became his full-time business which ultimately turned into a new car dealership. In November 1966 I returned from a three-year tour of military duty overseas. I needed a car and turned to Mort. He recommended a 1965 Chevy Bel Air. I bought it and it remained in the family for many years. In 1970 I again needed a car. I turned to Mort and he suggested a 1968 Buick. I kept it for a long while also. I also bought a 1985 Plymouth, a 1988 and a 1998 Buick from him over the years. Every one was a good dependable automobile. Mort died at age 87 Monday, August 8, 2011. He will long be remembered as a good and honest man. He always had a friendly smile and raised a fine family that has descended into grandchildren and great grandchildren. He was a friend, neighbor, and an honest automobile dealer, and it’s difficult to say that about many people. Thank you Mort for a lifetime of neighborliness. terror strikes without any warning. smoke churning up from a burning hell. groups and singles, bunches and pairs. a streaming mass of shaken mortals. another missile in the opposite tower. sadistic terror in our great nation. brave men all, these men in blue. gallant men entered and offered their lives. nerves of steel, hearts of caring. love of one’s brethren, they were sharing. When I was 40 years old I felt I was in fair shape, although I smoked rather heavily (up to two packs a day). At that time I spent little time thinking about health, much less cared about what I weighed, but I maintained about 165 pounds. At 5’ 10 ½” I certainly did not consider myself fat, much less obese. Time passed as it always does, and while I was 41 years old, I spent ten days in an intensive care unit after suffering a heart attack. The day I was transferred from there to a bed on a regular floor I asked Doctor Loinaz if it was okay for me to smoke now that I was no longer in a room containing an oxygen supply. Stating the exact right thing at the exact right time he spoke, “Yes, but your children will miss you.” With that he left the room, and left me contemplating what he had said. I reasoned that firstly he was absolutely correct, and further I had just gone 10 days without a cigarette, maybe I could go one more. That one more day has currently become nearly 32 years. I often say that everyone always has to pay for everything, it is just a matter of in what manner the payment is subtracted. In this case, to pay for a probable better lifestyle, the payment was in body weight gain. I began to slowly add pounds until when I was forced to quit working about 16 years later I weighed about 175, a gain of about 10 pounds. Then, with a decided drop in exercise, over the next 16 years I have added an additional 45 pounds, for a total of 220. Now that I am 73 years old it has become bothersome for me to walk more than a very short distance at a time. Knowing I was carrying about 55 pounds more than I did back in my former days, I wondered if that might have a lot to do with my walking inability. In line with this I decided to attempt losing weight. Although I know practically nothing about food health, diet, carbohydrates, vitamins, protein, or other related subjects, I do know how to lose weight even if it is not the recommended method. My method of losing weight was to place a normal serving on my dinner plate, put half back where it came from, and proceed to eat the remainder. I did this twice a day and skipped the third meal. I eat breakfast at noon, dinner at five, and nothing the remainder of the day. Breakfast is now one egg and one toast, versus two of each with bacon, ham, or sausage. May 1 I weighed 219; June 1, 209; July 1, 202; and today 194. It may not be scientific, but it is working. I yet get very little exercise. This is merely a restricted amount of food intake, I am eating everything that I previously did. Only quantity has lessened. David Parish’s grandfather was an English merchant with interests in Scotland. Seeking a better business environment he moved his base of operations to Hamburg, Germany, where David was born in 1778. David seeking business opportunities in his own right emigrated to Philadelphia in the United States in 1806. A couple of years later he acquired 200,000 acres in the beautiful valley of the St. Lawrence River along the New York/Canadian border. This he hoped to sell as farm land to potential settlers in the area. He made his headquarters in the village of Ogdensburgh which was the scene of a French fort built in 1749. Elena Vespucci was born November 29, 1804 in Florence, Italy one of six children, she was considered “indocile and unmanageable” by her parents. Before her trip to America in 1841she had lived as the mistress of some dozen men. To make herself more endearable to Americans she borrowed the name of her younger sister Ameriga, exchanged the G for a C and went merrily on her way, no longer known as Elena, but now America Vespucci, or on occasion Maria America Vespucci. President Martin Van Buren’s son, John, soon became the benefactor of the beautiful temptress and she traveled through the States with him, dancing at fancy balls in Boston, Washington, and other major cities. There came a night in the village of Evans Mills, New York when a high stakes poker game commenced. Several men of means were engaged in the not-so-friendly card game. Late in the evening only two players remained. They were the aforementioned John Van Buren and George Parish a descendant of David. John, down several thousand dollars, offered to George the hand of the beautiful America, bet against $5,000, on the flip of a coin. 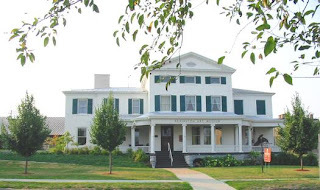 George the inveterate gambler took the offer, the coin was tossed, George won, and America went with George to his mansion in Ogdensburg, where she lived for 18 years, from 1842 through 1859. When she was 56 years old George sent her off to Paris never to return, and it is said she wept bitterly upon her departure. The old Parish mansion is presently used as the Frederick Remington Art Memorial.